Some items like the special-order tile and vanity top may take a few weeks to arrive, so patience is called for. Before you take a hammer to your bathroom, ensure you have everything you’re going to need. It might be frustrating to wait for every piece to arrive, but it’s wise if you don’t make your old bathroom useless until you have everything on hand. Ceramic tile shelving installed in one corner of the shower will do fine as a storage for your soap, shampoo, body wash and razor. Removing old flooring vinyl or tile can be really time-consuming, and even when you’re done, you’ll spot a few stubborn patches that would simply not come off. If you want to do this yourself to minimise cost, a simpler and faster way is to rip up the underlayment together with the floor covering. 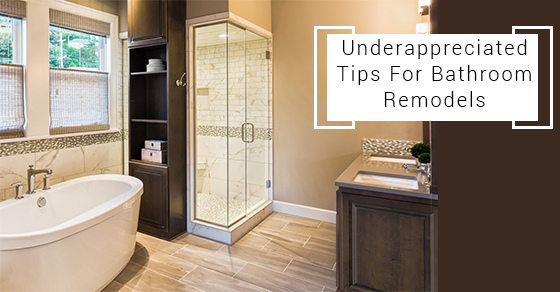 Besides ease of removal, getting rid of the underlayment may be of benefit in case it’s water-damaged, which is common around the bathroom. Glass or mosaic tile can be more expensive, but you don’t need to dig so deep into your pocket to add some pizzazz to your bathroom. You can use as little as a dozen sheets and you will still see the impact! Using the special tiles sporadically in the pattern or as a border gives your bathroom a punch of character and colour. If you have to call a pro to help out on any part of the project that you feel you cannot handle appropriately, do it! DDYI mistakes can be more catastrophic than you would imagine. You may need a plumber to help move water or drain lines or an electrician to run cable for heating controls. Pros may be more costly, but it’s worth it if they can solve a problem. Being among the most private spaces in any house, some time and scrutiny should be employed before making a selection on paint, faucets, mirrors, vanities, tiles, sinks and accessories that will make the new bathroom you want.